Lebanese jumbo tissue manufacturer will take part in leading Middle Eastern exhibition for paper, printing and nonwoven industries. 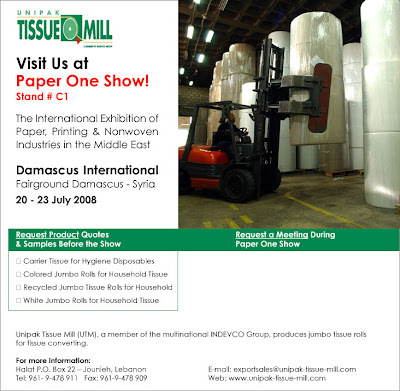 Unipak Tissue Mill will promote its virgin and recycled jumbo tissue rolls at Stand #C1 from 20-23 July 2008 at Damascus International Fairground in Syria. Tissue manufacturers convert jumbo tissue rolls into finished facial, toilet, napkin and hand towel products. Paper One visiting hours begin at 5 pm and end at 10:30 pm. Interested parties from the Arab region and beyond may request quotations for jumbo tissue roll products before the show.